The play of the game from Woodland’s perspective was the kickoff return to pretty much win the game. The Washougal Panthers kicked off to Tyler Flanagan and before he caught the ball, the Panthers knew that was not the plan. 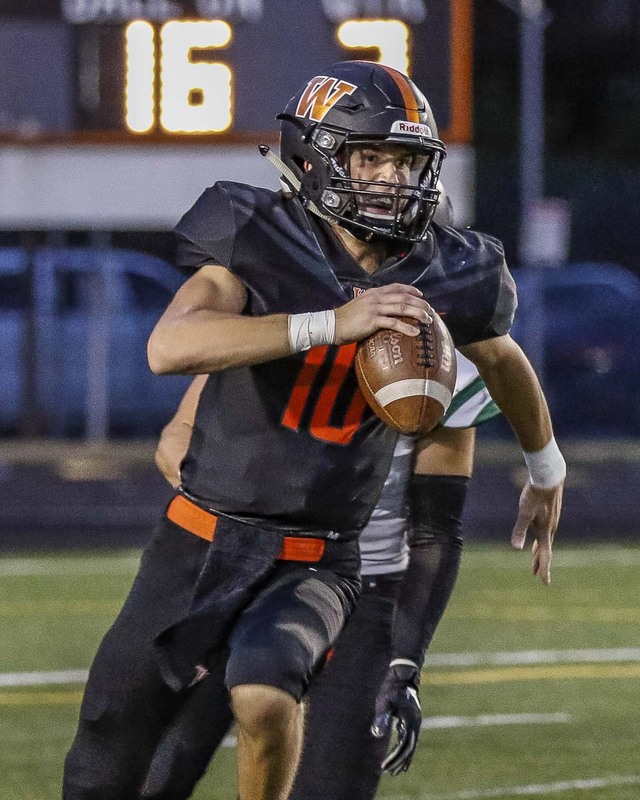 Woodland held off Washougal to register a 29-26 victory Friday in the Class 2A Greater St. Helens League high school football opener for both teams. 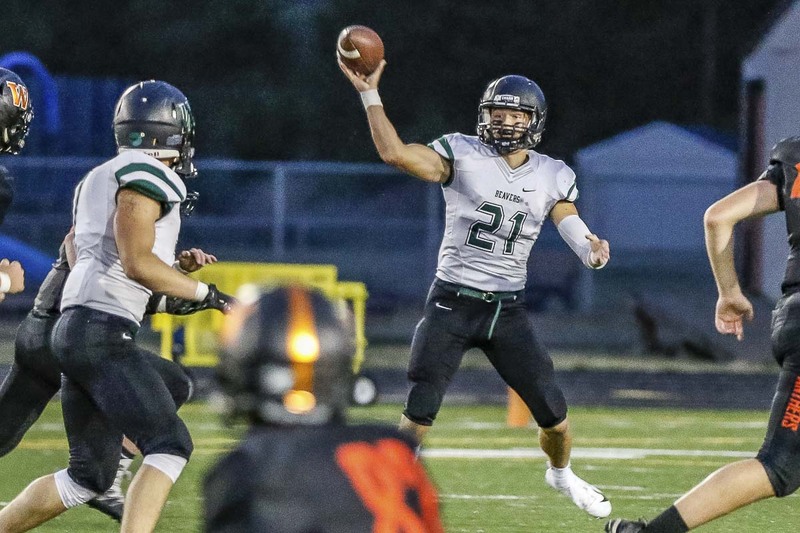 The Woodland offense, though, put the Beavers in position to win with a strong first half. The Beavers racked up 240 yards of offense in the first half to take a 22-14 lead at the break. Flanagan, much like he did the first two weeks of the season, was a dual threat quarterback. This is important because so many people just figured he would be a running quarterback. Oh, he is that. But he has proven he has some passing skills, too. In fact, he threw for 180 yards in Friday’s first half, which included a touchdown pass to Kenyon Guy. Flanagan would finish the night with 113 yards rushing and 223 yards passing, plus the 86-yard kickoff return for a touchdown the only time he touched the ball on special teams. Washougal would dominate the second half in terms of yards gained but never took the lead. Woodland’s defense made some opportune stops. The Panthers got into the red zone on their first drive of the second half, then pushed out of the zone when Jason Bowman, Bryce Graham, and John Arocan reached the quarterback for a sack. The next play, Guy intercepted a pass. On Washougal’s next drive, Arocan made back-to-back defensive gems. A defensive lineman, he hustled to take down a wide receiver on a receiver screen pass. On the next play, he was being double teamed and did not get any pressure on the Washougal quarterback, but he stayed focused. When the quarterback escaped the pocket and scrambled, it was Arocan who chased him down. He chased him down 13 yards downfield. A defensive lineman! Because it was third-and-really-long, that 13-yard gain did not extend the drive. Washougal punted on the next play. “I just read the ball and flow to the ball,” Arocan said. Simple enough. But in this game, every drive mattered, and Arocan had a big contribution to stopping that drive. Woodland coach Mike Woodward is enjoying being 3-0, but not close to being satisfied. He had a spirited post-game talk with the Beavers about poor tackling and not having the killer instinct. “I feel good about the win, but it’s just frustrating we can’t put four quarters together,” Woodward said. The Beavers will try to do that this week with a home game against R.A. Long. Should the Beavers improve to 4-0, that will make for one crazy Week 5 when they take on defending state champion Hockinson. This one could hurt a bit. Maybe even a little longer than usual. Sure, the Panthers have another game to play this week, but it is a non-league game. They will have another week to think about the league game that got away from them when they fell to Woodland in Week 3. No, Washougal never led in this one. Didn’t even tie the game. The Panthers did rack up yard after yard after yard in the second half, but only getting one touchdown when it mattered. The Panthers scored to make it 22-20 with 3:22 to play in the game. The 2-point try failed. Then Woodland returned the ensuing kickoff for a touchdown. Washougal, down nine, would get a touchdown on the final play of the game. Penalties and turnovers ended other opportunities for the Panthers. “We put ourselves in situations we shouldn’t have put ourselves in,” Washougal coach Dave Hajek said. From here on out, though, let’s focus on the positive for Washougal. The Panthers ended up with 460 yards of offense. The Panthers had 330 yards of offense in the second half. Peter Boylan was magnificent. The running back rushed for 128 of his 134 yards in the second half. He also caught three second-half passes for 54 yards. Yes, Boyle had 188 yards from scrimmage in one half. Quarterback Dalton Payne ended up throwing for 272 yards for the game. He also rushed for 34 yards. Jakob Davis caught 10 passes for 123 yards and two touchdowns. Julien Jones had seven receptions for 81 yards. Oh, and the Washougal defense slowed the Beavers, too. Woodland had 240 yards of offense in the first half, 146 in the second. Hajek said he was happy with his team’s ability to move the ball in the second half. Clean up a few of the miscues and Washougal might have come out on top. The Hockinson Hawks played their last two games of the 2017 season in Spokane and then Tacoma. This year, they opened in Toppenship and then Everett. And even the final three “home” games last season – playoff matchups – were at District Stadium in Battle Ground. So yeah, it had been a while since the Hawks played at their stadium. The 2017 Class 2A state champion Hawks returned home in Week 3 of the 2018 season. “So many people came out for us. The stadium was packed. Think they were all excited to see us play,” Hockinson coach Rick Steele said, adding that he believes it was the biggest ticket gate for a league game in the program’s history. Then the Hawks put on a show for their fans as the program won its 17th consecutive game. The first league game of the season, it was all Hawks in a 59-7 win over R.A. Long. Hockinson is chasing its fifth consecutive league title. Jonathan Domingos led the defense again, all over the field from his linebacker position, the coach said. Quarterback Levi Crum “only” attempted 13 passes. He completed 10 of them, and six were for touchdowns. Yes, another one of those nights for the Hawks, who a year ago averaged 44.8 points per game in league. Oh, and those six touchdown passes? They went to six different Hawks: Sawyer Racanelli, Peyton Brammer, Aidan Mallory, Jeremiah Faulstick, Nich Frichtl, and Wyatt Jones. The Hawks also got to take a breather. Most of the starters played limited minutes in the second half. Next for the Hawks is another road game, this time to Columbia River. 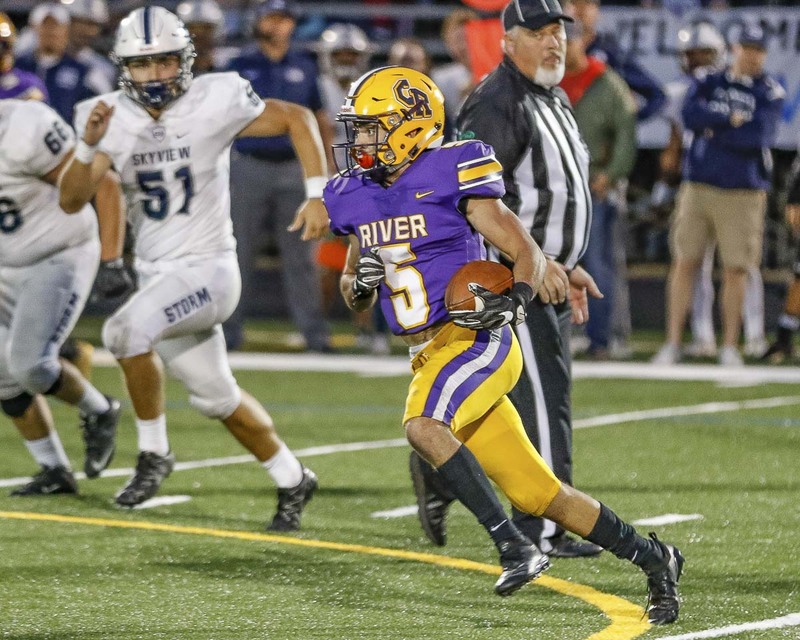 With a senior-dominated team, the Chieftains came into this season with high expectations, with the belief that they could content for a league title. Clearly, the Hawks have won bigger games, but this is the biggest game this week and the Hawks say they will be prepared. Here we are, the big game for the Columbia River Chieftains, the one they have circled on the calendar all offseason. With more than 30 seniors, this is one of the few teams on Hockinson’s schedule that could possibly slow down the Hawks. Two years ago, the Hawks needed that now famous (at least famous at Hockinson) hook-and-ladder play in the final seconds to beat the Chieftains. Last year, it was all Hawks in a 42-14 win. “We didn’t feel like physically they dominated us. They just made some great plays,” Swain said of the 2017 matchup. Swain understands the reality that virtually no one outside the Columbia River team room believes the Chieftains will win Friday night. That’s OK, though. He only needs those in his team room to believe. No turnovers. Penalties to a minimum. That kind of stuff. “We’re going to have to play a disciplined, clean game,” Swain said. Before getting to Hockinson, the Chieftains opened the 2A Greater St. Helens League with a 27-7 victory over an improved Ridgefield squad. The Spudders went on a long drive in the first quarter to take a quick lead. Swain noted the play of Jarrett Seelbinder who scored on a punt return and a screen pass, as well as Isaac Bibb-O’Neil, who had two touchdown runs. Two other long runs were called back by penalty, but the coach was pleased with their efforts. On defense, Rylee Sadler, Erik Sarchi, and Logan Wilson were recognized for their strong showing. “Collectively, as a unit, we pretty much shut them down after the first drive,” Swain said. The Ridgefield Spudders did not get a win but did earn some respect last week as they opened Class 2A Greater St. Helens League play. First, they had an early lead. Second, it was tied at halftime. Columbia River would get three second-half touchdown to pull away for a 27-7 victory. The Chieftains had to earn it, though. Indeed. A year ago, Ridgefield went 1-8. This year, the team already has two wins and now a good showing against a playoff team from a year ago. The Spudders’ defense got a three-and-out on the first series of the game after a long River run was called back due to penalty. Clayton Madsen had a big hit on a little swing pass, jarring the football loose for in incomplete pass. On the next play, Brock Harrison was not fooled and stuff the ball carrier. River would punt, and Ridgefield set up on the 50-yard line. About an hour later (OK, maybe a slight exaggeration!) the Spudders were in the end zone. Ridgefield went on a 13-play drive, rushing for a total of 40 yards while also getting 10 more on Columbia River penalties. All running plays, too. The Spudders announced they had arrived. They would not score again, but they put the rest of the 2A GSHL on notice that this is not the same team from 2017.